Organising your closet is back in fashion. A closet has just one function and it does it well: it helps you organise all your clothes, shoes and accessories – which you complain of not having enough but which are constantly piling up – so that when you come to put together your look, even on the most hectic of mornings, all the elements are within reach. That means that there’s little point in having a closet when you cannot find a particular tie or the dress you want to wear is hidden underneath a pile of clothes which you haven’t worn in ages. Confession time: if your closet looks like a stampede of wildebeest has just trampled through it, it’s time to declutter and organise. We tend to have a strange relationship with old clothes. On one hand, we don’t want to wear them because they are so last season. But on the other hand, we want to hang on to them, just in case an item comes back in fashion. It might not be easy, but tossing out or donating clothes which you don’t wear any more is key to making a bit of room in your closet. The same applies to clothes which no longer fit you. The rule of thumb here is that if something is two sizes too small or two sizes too big, then get rid of it. The only exception should be clothes which have a sentimental value. To take stock of what should stay and what has to go, unload all the contents of your closet and sift through the old, the new and the dress which is so out of fashion that your grandmother likes it. 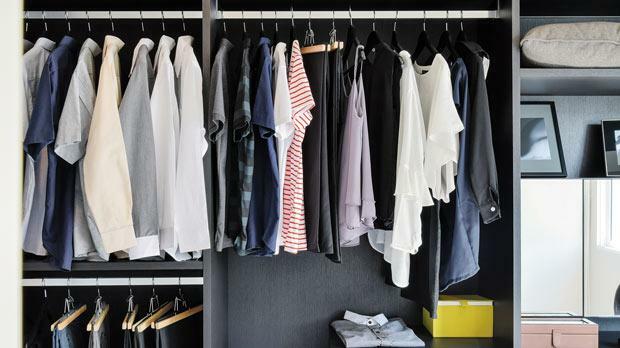 leave your closet more cluttered than it originally was. Every item requires a different form of organisation. The key is to organise everything in different sections of your closet. With jeans, for instance, fold them up nicely and put them on a shelf. If you have more than six pairs of jeans, you can also organise them according to fit or to colour. The same applies to sweaters. First of all, don’t hang them as, especially the heavier ones might lose shape on a hanger. Fold your sweaters and colour-code them. To make the perfect sweater folds, you can invest in a sweater folding board. When it comes to dresses, shirts and formal trousers, it’s best to hang them: do so either by length, colour or season. When planning or organising your closet, dedicate generous space to your shoes because, while you might think that you don’t have enough, in reality you have too many. Don’t leave shoes in their boxes as these take up too much space. Take them out and organise them according to colour or season. The same applies to bags. Leave them out on show – after all, they will not get damaged out of their dust bags. And you get to enjoy the view. For accessories, it’s best to put them all in a drawer – otherwise, the smaller items might get lost. When you originally had your closet fitted, you had a certain amount of clothes. Nowadays, you probably have more and, consequently, you need more space. Update your closet by making use of wasted space. Also, it’s a good idea to add lighting. Having shelf lighting will not only improve your closet’s looks, but it will also help you find items easily.